Renesas Electronics (“Renesas”), a premier provider of advanced semiconductor solutions, and TTTech Computertechnik AG (“TTTech”), a global leader in robust networking and safety controls, today announced that they have developed a highly automated driving platform (HADP). 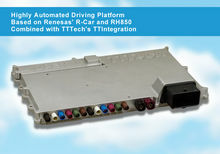 The new HADP is a prototype electronic control unit (ECU) for mass production vehicles with integrated software and tools, which demonstrates how to use Renesas and TTTech technologies combined in a true automotive environment for autonomous driving. The HADP accelerates the path to mass production for Tier 1s and OEMs. The automotive market is moving rapidly to make autonomous driving a reality for consumers by 2020. The increasing information from sensors as well as its assessment and resulting actions require hardware and implementations of software that have high performance and comply with highest safety standards. Furthermore, the broad range of sensors and functions means new challenges for the implementation and integration of software. The newly released HADP is the first outcome of the collaboration between TTTech and Renesas announced in January 2016, and is an extended version of the HAD solution kit released in October 2016. It is based on dual R-Car H3 system-on-chips (SoCs) and the RH850/P1H-C microcontroller (MCU). The HADP has been developed based on an ASIL-D functional safety concept (Note 1). It supports a highly efficient integration process for complex highly automated driving systems. The HADP can be used by Tier 1s and OEMs to immediately prototype their functions in an embedded automotive ECU. It shortens time to market by enabling system developers to verify and integrate software easily on the prototype ECU designed to deliver a faster track to mass production vehicles. The ECU has been developed for automotive sample grade quality following requirements on thermal design and shock resistance. It is provided in an aluminum housing targeting IP51 protection level (Note 2) for mounting in the passenger cabin or luggage compartment. The HADP can be directly connected to an automotive power supply and is designed to work at -40 to +85 °C operation temperature and exposed to vibrations in a running vehicle. The HADP comes with cabling and guidelines for easy adaption inside a vehicle. TTIntegration is a software platform that provides all the services to run several safety critical applications in parallel on multiple SoCs. A sophisticated partitioning concept ensures that safety related applications cannot be impacted by other applications running at the same time. Due to a co-simulation environment on standard PC it is possible to develop functions on the embedded HADP platform side-by-side with applications running on a PC. They all can share the same data and services as if it would be a single domain ECU. Seamless integration and testing of all applications are remarkably faster and more efficient in comparison to the usual step-by-step solutions. The HADP and development support are scheduled to be available in Q2 2017 by TTTech. Refer to the separate sheet for the main specifications of the HADP.